To celebrate Ferrari’s 70th anniversary, the Italian supercar maker and its partner Hublot are presenting a new original collection of watches -The Techframe Ferrari 70 Years. Conceived with the same approach used for designing a car at the Ferrari Design Centre and integrating Hublot’s watchmaking expertise, the timepiece is available in three versions – King Gold, PEEK Carbon, and Titanium – each of which is produced in 70 limited editions. The new Techframe Ferrari 70 Years Tourbillon Chronograph was designed with the same creative processes used to develop a new sports car. 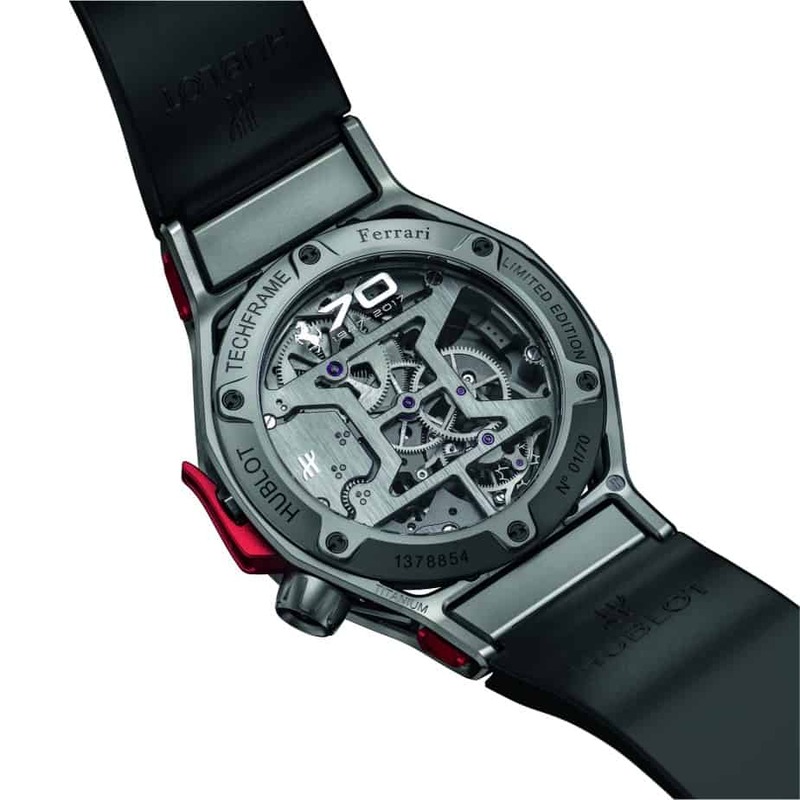 The starting point for the designers was the Hublot movement – the “engine” of the watch-around which they freely designed a high performance chassis. 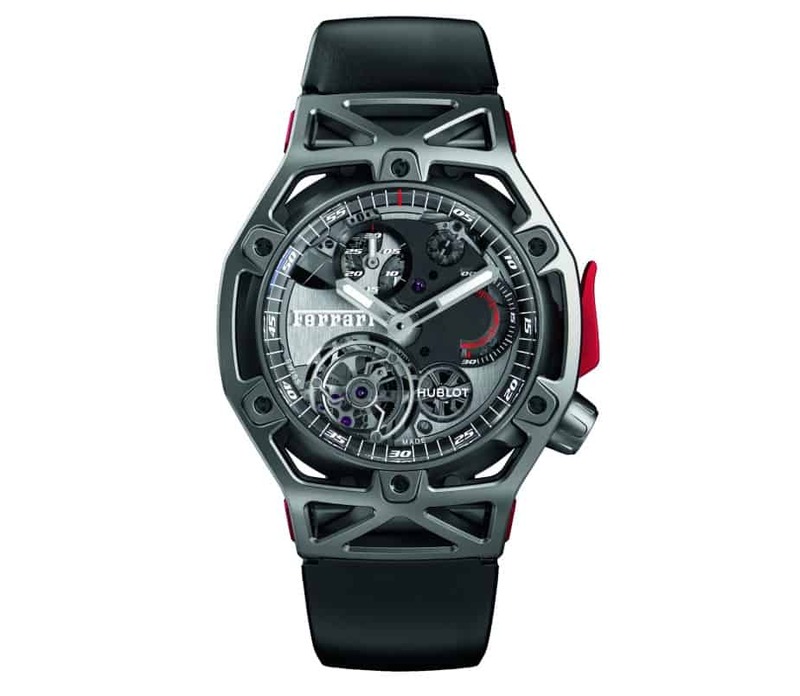 Like that of a Ferrari, its lattice structure-that is unique in the world of watchmaking-offers maximum strength for minimal weight. “The styling of the Techframe Ferrari 70 Years Tourbillon Chronograph underlines the performances of the watch and no component is there by chance,” said Flavio Manzoni, Head of Design for Ferrari. The black structure on the dial holds the chronograph counters and offers excellent legibility. The crown at 4 o’clock -raised by a black PVD Titanium insert decorated with the famous Prancing Horse-reduces the size of the watch to the greatest possible extent, and increases its aerodynamic look. Finally, the red push-button is strategically placed to facilitate its use and makes the design more ergonomic. This new line in Hublot’s collections is intended to offer a watch that is deeply rooted in Ferrari’s DNA, combining strength, performance and agility. It is the perfect fusion of the automotive and watchmaking worlds.